This game was made for the weekly game jam 79 on itch.io. You are Ronald. You have struggled for years, drifting from job to job, nearing bankrupcy so many times. Then, one day, you have an idea. 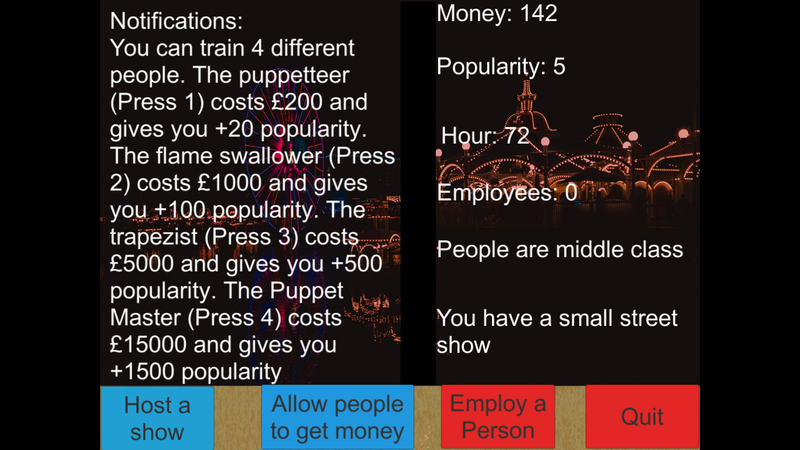 You decide to hold a puppet show. You do that and start getting money, a little at first, then it gets more and more. 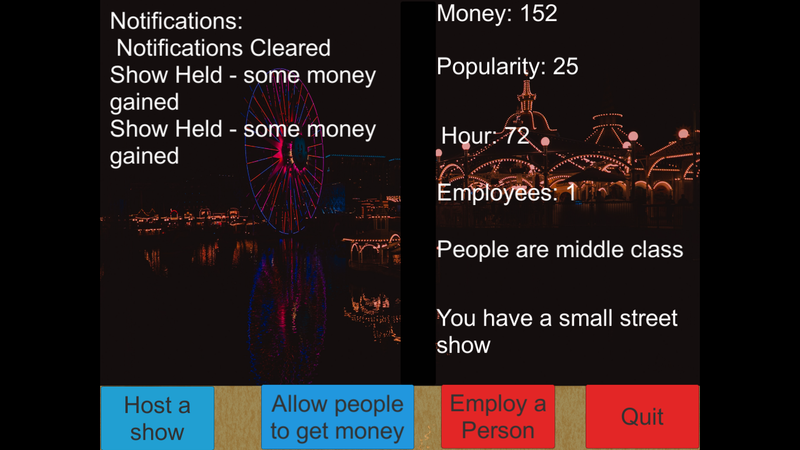 Press Host a show to get more money. 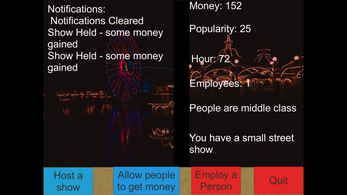 The more money you have, the more money you will get from hosting a show. 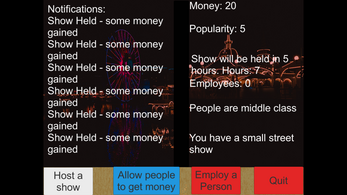 However, when you host a show, people get poorer and poorer. If you press 'Host a show' too many times, people will have no money and you will lose. 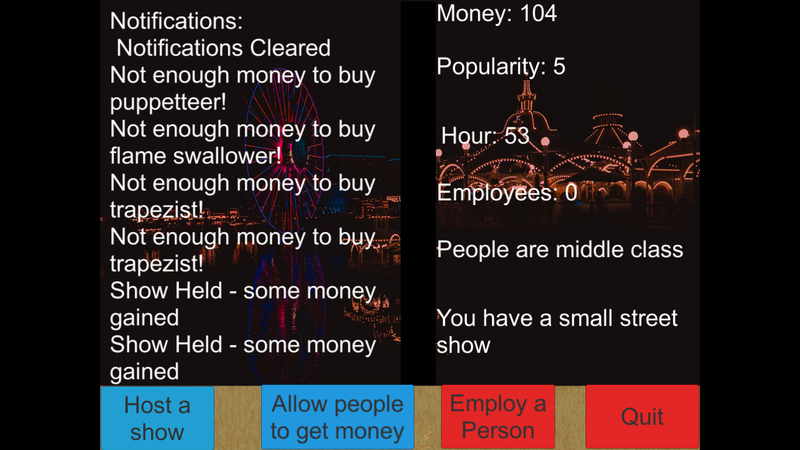 So once you have pressed 'Host a show' more than 11 times, you can press 'Allow people to get money', and people will get rich again. You can then host a show 11 more times. 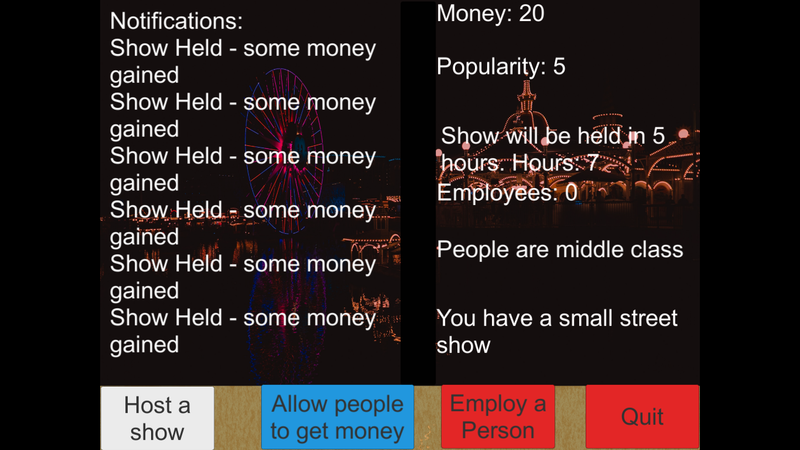 However, hosting a show will cost 10 money. If you have no money you will lose, so be careful. You can also hire workers to work for you, which costs money, but gives you more money, which in turn gives you a bigger street show. 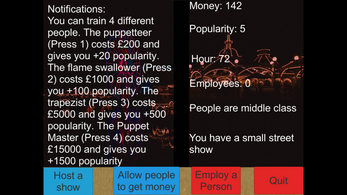 Th aim of the game is to get a circus. When you have done that, you win. Just extract the .zip file it downloads, and run the .exe file inside the folder that you will see. Remember to not play the game on windowed mode, and select 1024x782 screen size for it to work properly. Changed the game UI again!! I changed the thumbnail! Do you like it? 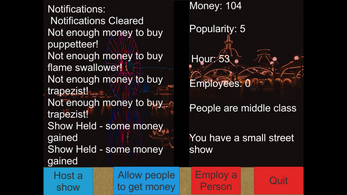 Also, I will change the game page at some point, and update it since I changed the UI. Honestly, so far the premise for your take on "Puppet Master" seems really fun! Cant wait to get my hands on it! Hi! Sorry, the page is ugly, I made it very quickly! The game jam ends in 3 days, so I have 3 days to make the game awesome! Also, I will take time later to make this page look good. Edit: Ok, now it looks awesome!